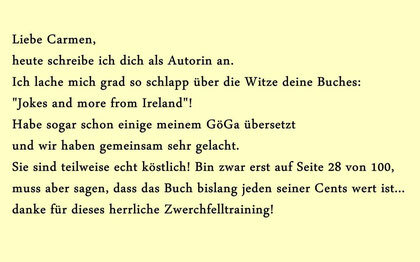 Dr. Carmen Bauer, geboren in Wiesbaden, lebt seit einigen Jahren in Nord-Irland. Von vielen Menschen in Deutschland auf Witze in Englisch angesprochen, hat sie nun eine Auswahl an sehr abwechslungsreichen Witzen, die sie über die Zeit in irischen Pubs und anderswo gesammelt hat, in diesem Buch sorgfältig zusammengetragen. Wer immer sein Englisch auffrischen will sollte sich diese Sammlung gönnen. The outside cover of the book refers to its original German title. However, inside you will find it is all in English. 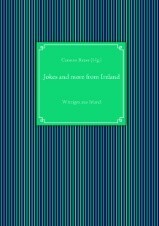 This book is a collection of a variety of jokes and brainteasers from different walks of life, which the editor gathered in and around Irish Pubs. Some jokes contain mild adult humour. Dr. Carmen Bauer was born in Wiesbaden (Germany). She moved a few years ago to Northern Ireland, where she now lives with her partner. Rafferty had been told to attend hospital for a minor operation, but he was afraid. So when the fateful morning arrived, he lay in bed determined not to go. So Rafferty arrived at hospital and was bathed, changed and safely tucked up in bed. Murphy and Cathy are senior citizens. Murphy always wanted a pair of alligator cowboy boots. But was never able to afford such expensive boots. One day he sees them on sale, buys them and wears them on his way home. When he arrives home, he asks his wife: "Well, do you notice anything different about me?" "What's different?" Frustrated, Murphy goes into the bathroom, undresses and comes out completely naked, wearing only his new boots. Again he says, "Cathy, do you notice anything different?" "What's different, Murphy? It's hanging down today; it was hanging down yesterday and will be hanging down again tomorrow." Angrily, Murphy yells, "Do you know why it's hanging down? 'Cause it's looking at my new boots!!" Upon which Cathy replies, "You should have bought a hat!" „Bei diesem Witzebuch stimmt einfach das Gesamtbild und das bringt es auf 5 Sterne. Worth a read a great outside view looking in from Carmen Bauer on Northern Ireland and Ireland as a whole.